Acupuncture is the best-known and widest spread part of Chinese Medicine in the western world. It aims to influence body functions and stimulate and restore the body’s own regulatory system by using specific points on the surface of the body. Besides the using of needles, the application of pressure (acupressure) and heat (moxibustion) are traditionally also used. Diagnosis and treatment are conducted in accordance with the individual pattern of disturbance and are based on traditional concepts, centuries of experience and on modern scientific basic research, clinical studies as well as on western ways of thinking. Acupuncture is practiced in various medical specialties in prevention, therapy and rehabilitation of functional, psychosomatic and organic diseases, and in pain management. Acupuncture can be combined with other therapeutic applications of Chinese Medicine such as herbs, dietetics, Tuina (massage and manual therapy) and Qigong (exercises, breathing, concentration). Acupuncture is often integrated in many therapeutic settings of mainstream medicine. Approximately 80,000 physicians in Europe practise acupuncture. Acupuncture as a distinct therapeutic system is recognised by law in 12 EU Member States, ie Austria, Belgium, Bulgaria, Czech Republic, Denmark, Germany, Greece, Hungary, Latvia, Portugal, Slovenia and Spain. In Bulgaria, Czech Republic, Greece, Hungary, Latvia, Slovenia and Spain, this method is explicitly allowed to medical doctors only. In Belgium and Portugal the law does not explicitly exclude non-medical practitioners, but has not yet been implemented. In Denmark it is allowed for everyone, both individuals with and without a medical authorization, to perform acupuncture for therapeutic purposes. In some countries where the government delegates the tasks of authorisation, registration and supervision of medical doctors to the national medical associations, statutory regulation has been introduced by the national medical associations. 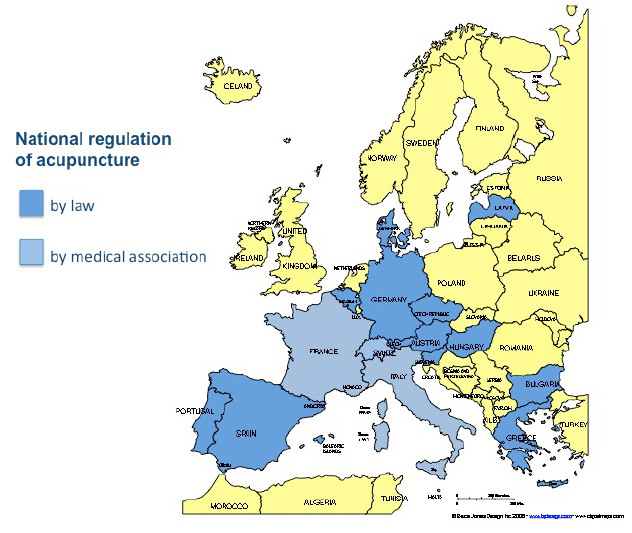 The medical association/council/chamber has recognised acupuncture as an additional medical qualification in the following countries: Austria, Bulgaria, Czech Republic, France, Germany, Greece, Hungary, Italy, Portugal, Slovenia, Spain, and Switzerland. In Latvia as a medical specialty. In Austria, Bulgaria, Germany, Italy, Portugal, Spain and Switzerland the diplomas of medical acupuncturists are issued by the national medical association/chamber/council, in other countries usually by the national medical acupuncturists’ association. Diplomas issued by the national medical acupuncturists’ association are officially approved by the government in Latvia and are recognized by the national medical council/chamber in the Czech Republic and Italy. Approximately 80,000 medical doctors in the European Union have taken training and education in acupuncture. Familiarisation courses about acupuncture are provided in the medical undergraduate curriculum as a part of a course on Complementary and Alternative Medicine in the Czech Republic, Germany, Hungary and the Netherlands; as a separate subject in Austria, Bulgaria, France, Germany, Hungary and Spain; and as a part of Traditional Chinese Medicine in Germany and Latvia. Familiarisation courses are optional for medical students in the Czech Republic, France (one university), Germany, Hungary (one university) and Switzerland (some universities), obligatory in the United Kingdom. Postgraduate training courses in acupuncture for doctors are provided at universities in the Czech Republic, France, Hungary, Latvia, Portugal and Spain, in other countries at private teaching centres. Acupuncture is an official part of the Continuous Education Programme for doctors in Germany, Greece, Hungary and Latvia. A professorial chair of acupuncture exists in Austria (Vienna, Innsbruck, Graz), Bulgaria (Sofia), Hungary (Pécs) and Latvia. 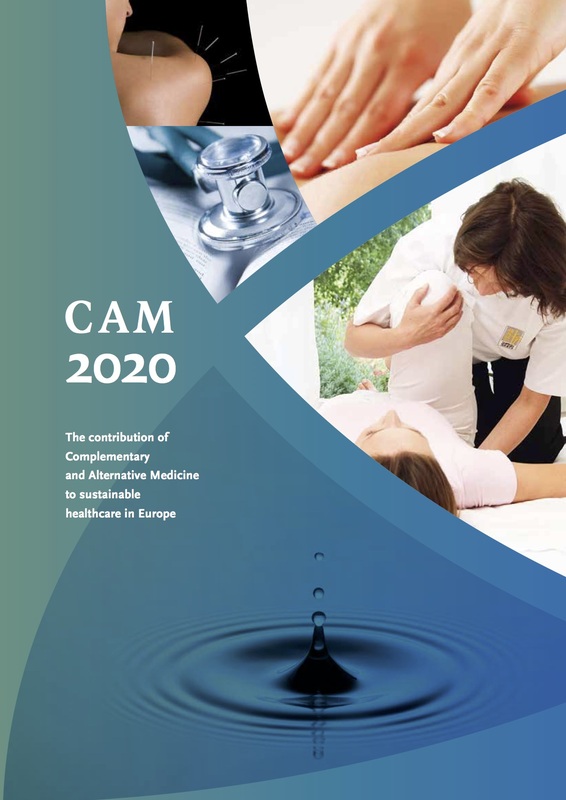 A chair of CAM including acupuncture in France (Nantes), Germany (Berlin), Switzerland (Bern) and the United Kingdom (Exeter, Sheffield, Thames Valley, Southampton). As acupuncture continues to grow in Europe, hospitals and Western health institutions increasingly incorporate medical acupuncturists as staff members of the institutions or as contractual providers. In Germany there are several hospitals providing Traditional Chinese Medicine, including acupuncture. In Italy and the Netherlands the national medical acupuncturists’ associations require a defined amount of CME from their members. Continuing Medical Education in acupuncture is obligatory for all medical acupuncturists in Hungary (controlled by the government), Germany (for those who participate in the national health insurance system), Austria and Bulgaria (controlled by the national medical associations/chambers/councils), and in the United Kingdom (controlled by the national medical acupuncturists’ associations). In Austria, Denmark, France, Germany (partly), Italy (some regions), Slovakia, Spain (one region) and Sweden the fees for acupuncture treatment are covered by the national health insurance system, in Austria, Bulgaria, France, Germany, Greece, Italy, Latvia, Netherlands, Portugal, Spain, Switzerland and the United Kingdom (also) by additional private insurance companies. There is only partial coverage in Hungary, Italy, and the Netherlands. The costs of prescribed traditional Chinese herbal medicines are covered by the national health insurance in Austria, France and Spain, by additional private insurance companies in Austria, Bulgaria, France, Hungary, Italy, Latvia, Portugal, and Spain.